Top offer: Buy the set containing Power Cage, Pulley sytem and Dips attachment and save 26 % compared to the RRP! Even better in the set: The Darwin Power Cage in a cost saving set together with the Cable System and Dips attchment! 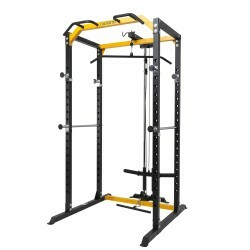 The Darwin Power Cage is a very sturdy cage with an 18 times adjustable weight rack. 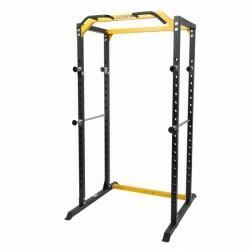 The Power Cage is ideal for performing safe and effective dead lifts, for performing bench presses and squats. In addition, the Darwin Power Cage is equipped with a chin-up module with five different grip varieties. Upgrade your Darwin Power Cage withi additional possibilities for working out the biceps, the triceps, and the back with this attachment. 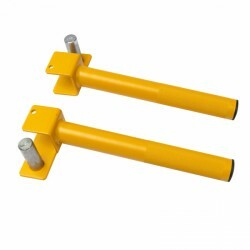 The machine is equipped with a high and a low cable pull and can be loaded with weight plates. 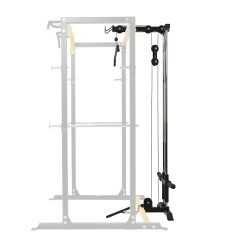 The Darwin dip module for Power Cage can be easily attached to the Darwin Power Cage and upgrades the training options for the triceps (with dips) and the abdominal muscles (with leg lifting). 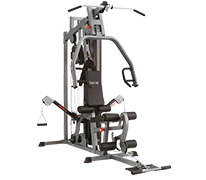 When you want to buy a multi-gym, which offers you high-quality and smart workmanship at an attractive price-performance ratio, the Darwin multi-gym is the right choice. The machine offers you versatile exercising possibilities at maximum comfort and on smallest space. Its compact dimensions make it the perfect multi-gym, when you only have little space at home and still want to do a holistic strength training at home. Get the ideal fitness machine for a compact and functional workout at home with the Darwin Power Tower. Beginners and pros benefit from it in the same way, if they want to train their body effectively and holistically with the Darwin Power Tower. The exercises with the Power Tower are controlled via one's own body weight and not by the means of weights. The effective strengthening of the muscles in the upper part of the body is supported in particular. Besides a dip module and a chin up bar, the Darwin Power Tower also provides special handles for doing push ups. The Power Tower can be combined ideally with further fitness components like physiotubes, powertubes or weighted vests in order to extend the multi-functional workout. Functional training with a Darwin multi-gym offers you the perfect addition to the classic stamina (cardio) and strength training. Due to the use of one's own body weight, whole muscle groups are targeted and get strengthened through their interaction. A distinctive difference to exercises with strength equipment is the free, non-guided training. Besides strength, it allows for a targeted training involving the whole course of movement of the body as well as of balance and muscle coordination. In addition, a muscular imbalance can be remedied and the physical reactivity is optimised with the functional workout. The Power Tower is the multi-gym for fans of Functional Training.